Very rare and highly sought after 51 year old original and only issue of the AMT 1965 Dodge Coronet HEMI CHARGER 3 in 1 customizing kit. Produced exclusively in 1965 by the original and late AMT Corp. This vintage kit # 6025-150 is 100% complete. Making this a true blue chip collectible that is destined to appreciate in value. 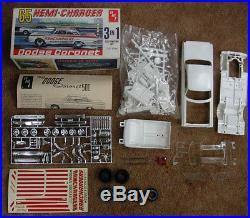 Model can be built stock custom or as the most famous Ramchargers drag car. Includes a dual quad 426 HEMI motor also with a supercharger option. M&H drag slicks , headers etc. Original chrome is still bright. Glass is clean and clear. Also pictured on the box art is a Color Me Gone version of the car. All items are packed well. These charges are the buyers responsibility. The item "51 year old AMT 1965 Dodge Coronet HEMI CHARGER 3 in 1 customizing kit COMPLETE" is in sale since Friday, April 08, 2016.